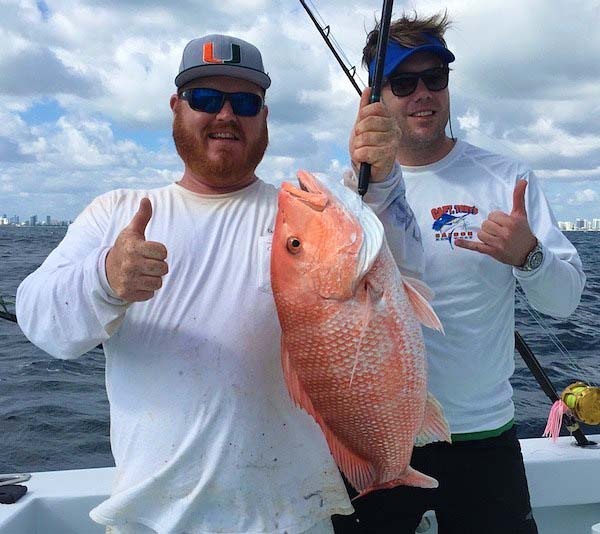 Miami Fishing November… Late Fall and early winter is a great time to go charter fishing off Miami and Miami Beach. The fishing heats up as the weather begins to cool off. Deep Sea Fishing for Sailfish, Sharks, Mahi Mahi, Kingfish, Tuna, Amberjack, Snapper and Grouper and more. All of these species of fish are available to target off Miami Beach. Sailfish make a strong showing this time of year. As the water temperature starts to cool, Sailfish find the western edge of the Gulf Stream. This time of year off Miami and Miami Beach the Gulf Stream edge will flow over the deep reef edge. With large schools of bait fish like Ballyhoo and Flying Fish the Sailfish are right in with them. We target fishing for Sailfish in many different ways. Trolling a combination of lures and natural baits is very effective in the fall. Baits like fresh cut Bonita strips and fresh caught Ballyhoo work well. Another great fishing method is slow trolling live small Bonita called bullets or flips in our new Gem lux Carbon Fiber outriggers. We also like to use smaller baits like Thread Herring and Pilchards. In addition, Kite fishing is another wonderful way to target Sailfish Miami Fishing in November. We can use a wide variety of live baits in the kite. Some examples include Blue Runner, Thread Herring, Pilchards, Scads, while Goggle Eyes are one of the best. As the fall weather cools the ocean to the North Mahi Mahi begin to migrate to the South. While these fish migrate South they will follow the western edge of the Gulf Stream. 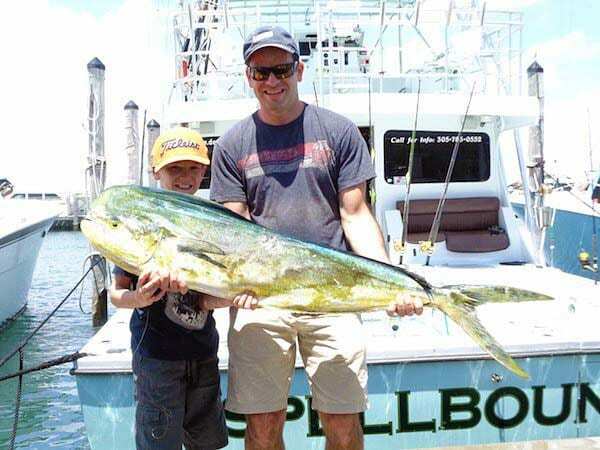 With the edge of the “Stream” just a mile or three off the Miami Beach we get some great Mahi Mahi Fishing off Miami.Although there are many ways to target Mahi Mahi trolling is one of the best. We use a variety of small lures, feathers and natural baits on outriggers and flat lines. We find Mahi Mahi feeding under birds like Frigate Birds and Sheer waters. As well as under floating debris and weeds. Another successful methods are kite fishing and live bait fishing. Fishing for Snapper, Grouper and Amberjack on ship wrecks, rock piles and reefs off Miami and Miami Beach is a great fishery in November. With schools of bait migrating into our area the deeper wrecks and reefs become home to a wide variety of bait fish. 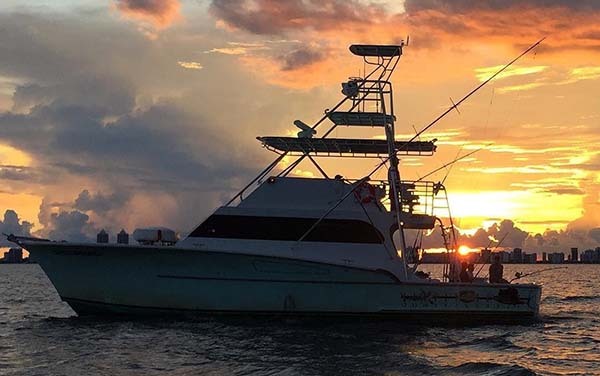 Game fish like Red Snapper, Mutton Snapper, Yellow Eye Snapper, Vermillion Snapper, Black Grouper, Gag Grouper, Red Grouper, Almaco Jack and Amberjack all find our wrecks and reefs.We target these Game Fish on the wrecks and deep reefs with a combination of live Baits, dead baits and cut bait. With most of the best wrecks and reefs in water as deep as 200′ to over 400′ we need to use fishing weights from about six ounces to over three pounds. Just depends on the wind and current.